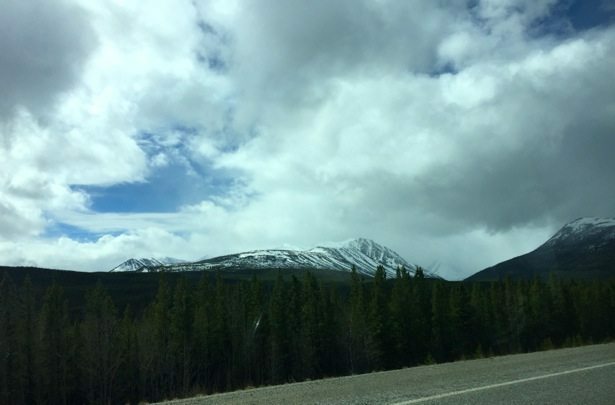 The Yukon is a beautiful, majestic place to call home. 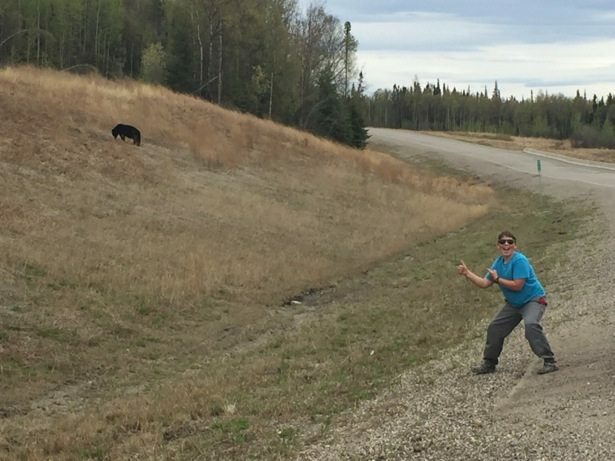 It is home to 36,000 people and has a bountiful population of wildlife (bears, moose and caribou being the most popular). What it isn’t is close – to ANYTHING… This makes driving home an epic adventure in itself. Many people google the distance and do the usual math of the distance divided by their average speed (usually around 120 km/hr). This makes it look like a somewhat reasonable 2 day drive. To be clear – it’s not. 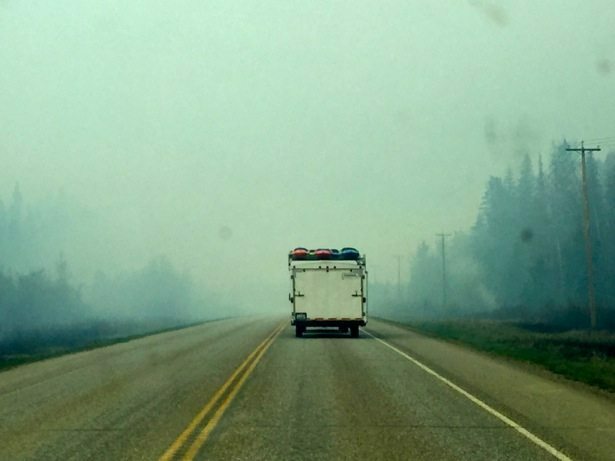 When you travel north you need to account for forest fires, animal traffic, road construction and windy windy roads. Gas planning is also critical as there are long distances without any gas stations and many aren’t open late at night. 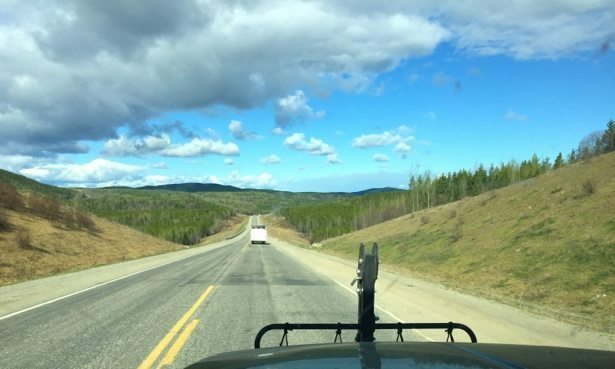 We traditionally fuel up in Dawson Creek, Fort Nelson, Muncho Lake (if needed) and Watson Lake. 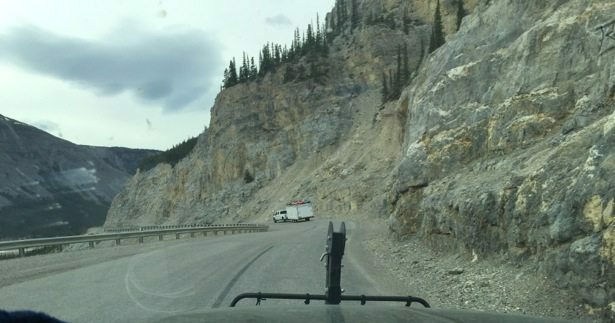 Our week in Calgary/Kananaskis was an expensive one. We took advantage of being in a large city that has selection as well as discounted prices due to the depressed economy at the moment. 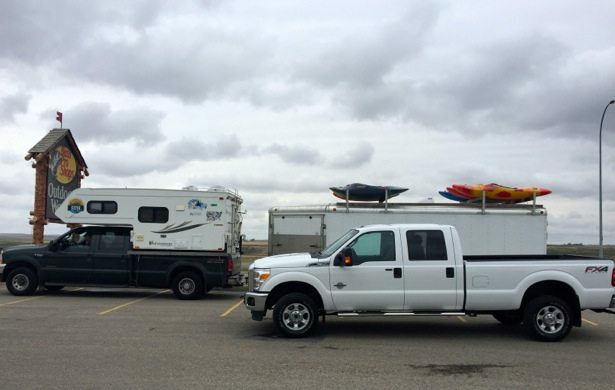 The final tally was 3 Jackson Rockstar kayaks (2 of 2015 vintage and 1 2013), the usual splurge at Mountain Equipment Co-op and a 2015 F350 truck to provide the towing power that we really do need. We were late heading out on departure day as we had issues picking up the truck. This lead to us making a pit stop at the Bass Pro Shop just north of Calgary to take advantage of their large parking lot to switch up the towing situation. Our little caravan up the highway was comprised of Fordo (Green F250 with Camper), new shiny Ford F350 towing the trailer and our nephew from Saskatchewan in his ancient Toyota. 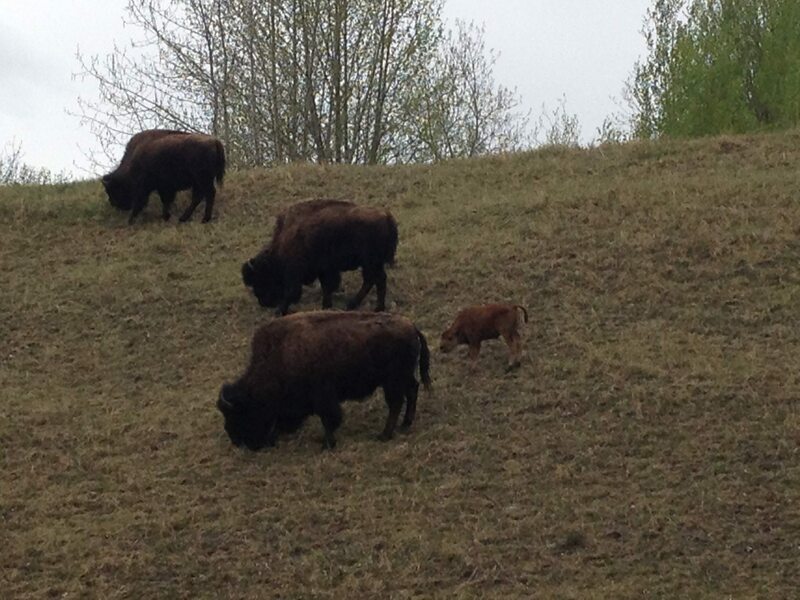 The Alberta leg took us north of Calgary towards Edmonton then north west to Grande Prairie. We had good roads and very little traffic, which made driving easy. 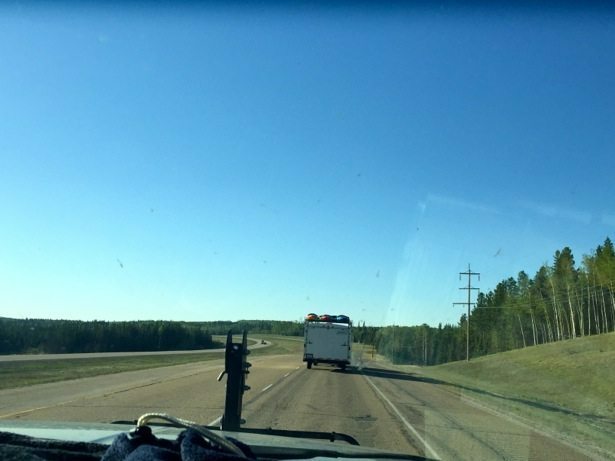 We pushed sunlight and drove until an hour after dark to get to Dawson Creek (** note – think Northern sunshine – dark was from 9:30 – 10:30 pm). The timing of this wasn’t great as the road goes from a nice divided four lane highway to undivided two lane just west of Grande Prairie. I definitely recommend trying to do this whole stretch in the light for safety. 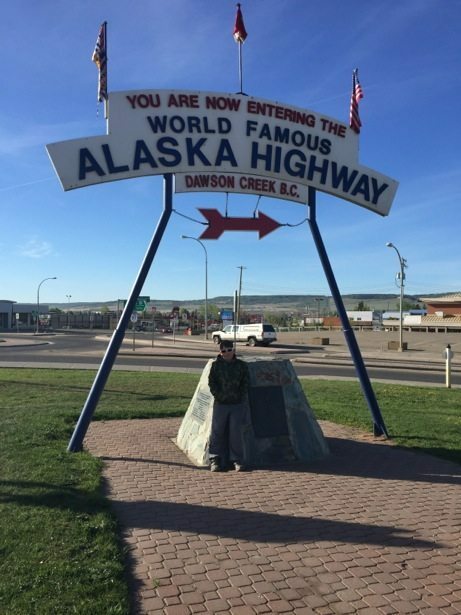 After a night boondocking at the Dawson Creek Walmart we grabbed a quick pit stop at the visitors centre to get our photos with the Mile 0 sign – a must do for anyone travelling this highway! 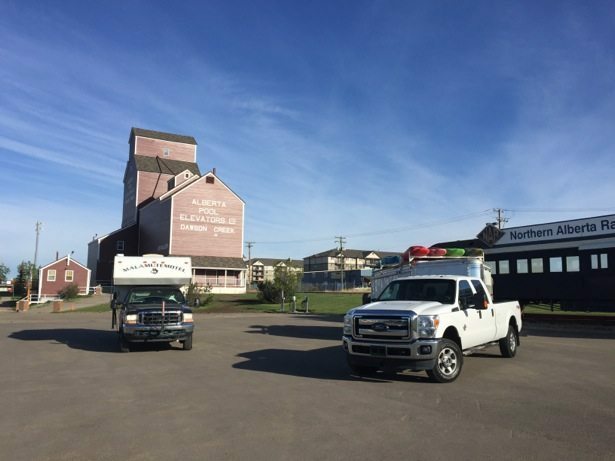 The visitors centre is easy to find and right on highway 97 – just look for the large grain elevator. 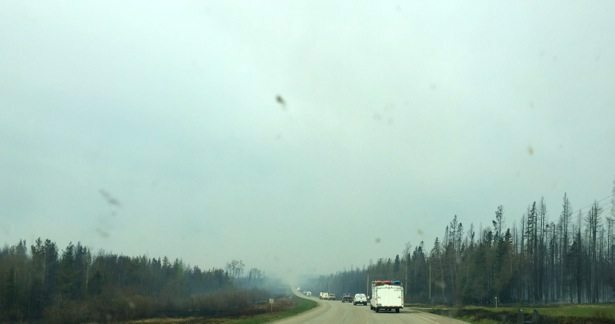 We got really lucky with our travel timing as the road north from Fort St. John had been closed due to forest fires the day before and just opened up for pilot cars at 8am on our second day. We were up and out from Dawson Creek early to ensure that we could get through while this window was open. The fire activity was definitely easy to see. At one point we were stopped waiting for the pilot car and could watch the helicopters dumping fire retardant on a number of hot spots. When driving through the fire you could see where the fire had jumped across the road the day before. 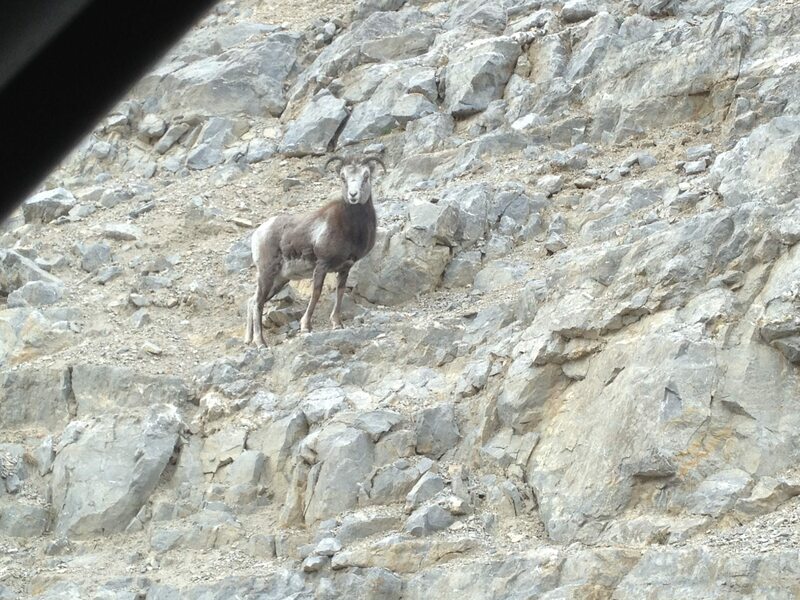 Day two was great for wildlife sightings. 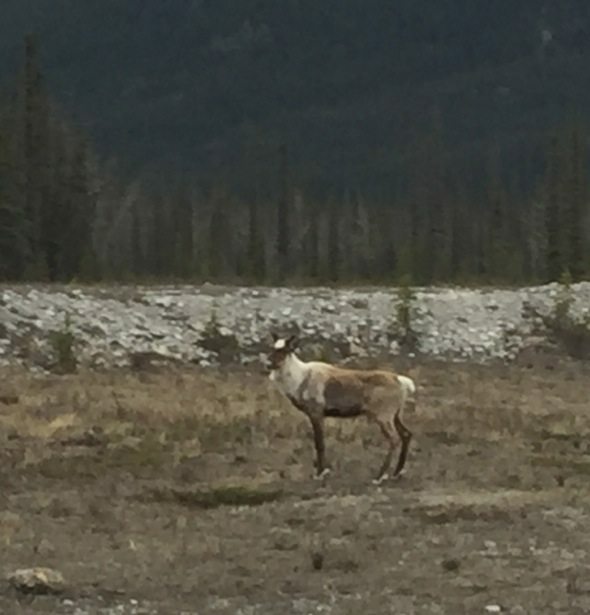 By the end of the day we had seen every major animal (bear, moose, mountain sheep, bison, fox, and caribou). Many of them were standing on the road or just beside the road which is a great reason to watch your speed as you drive north. Missing a sighting is disappointing. Hitting an animal will put a major dent in your schedule and your pocket book – especially if it happens in an area without cell service (there are many). 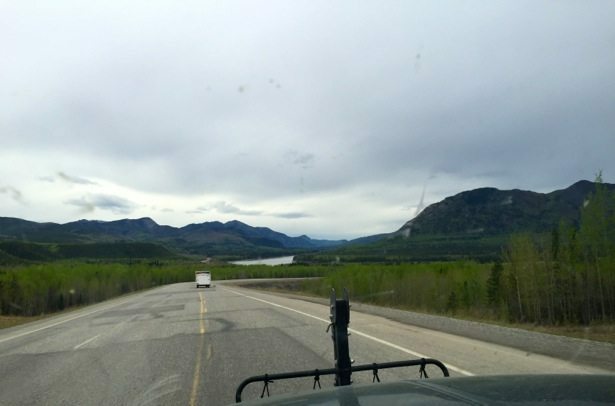 The drive through Northern BC takes you through some beautiful and changing geography. The region around Fort. 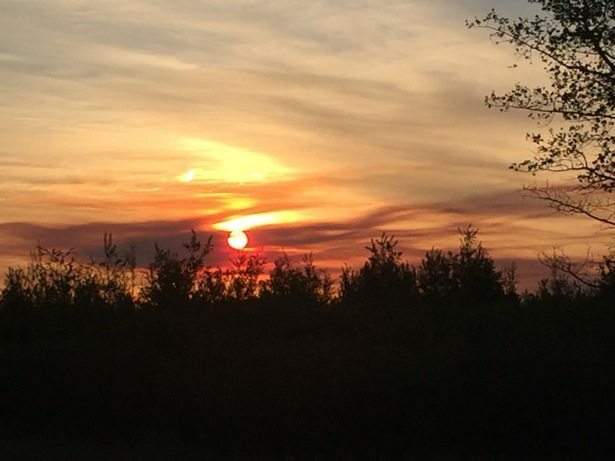 St. John and Fort Nelson is best known for it’s oil and gas resources but it also has very rich farming and ranching land. The hills then start to show up and things start to get windier and more rugged. You also find a lot of lakes and great fishing! North of Muncho Lake you end up in very steep, mountainous and rocky terrain set in between lake basins that are full of fishermen come summer time. Then you settle into more traditional mountain like terrain with mixed trees and undulating roads. 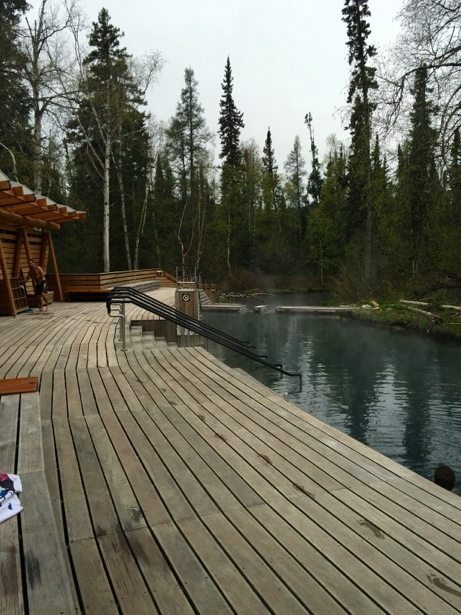 We always spend night #2 of the drive at Liard Hot Springs. It is a reasonable break point and is such a wonderful treat after a long day of driving. 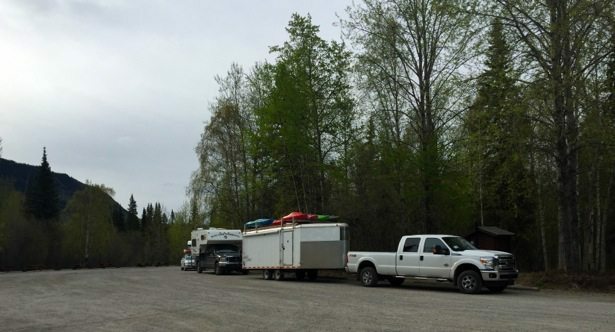 Due to our size, we just overnight in the day use parking lot although there is a very nice campground on site as well. 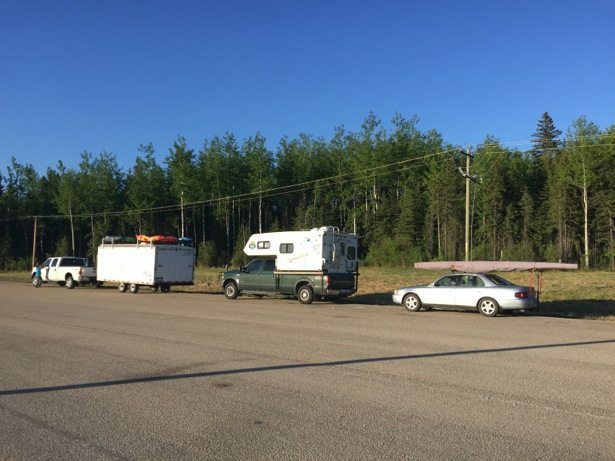 Be sure to still pay the camping fee if you overnight in the day use lot. 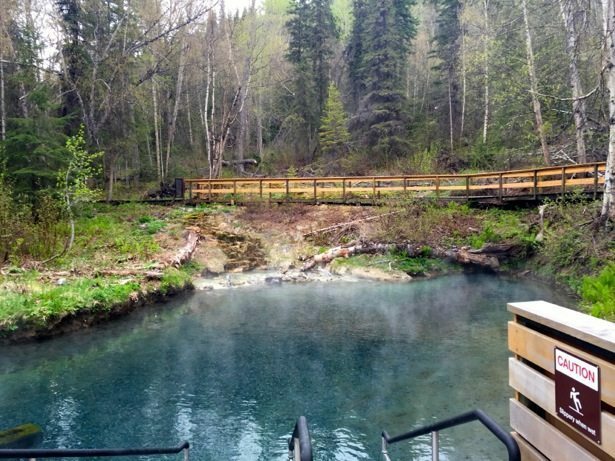 The hot spring is natural and the source is right at the top of the springs, flowing into a rustic river. The lower down you go the cooler it is, with kids usually playing below the “waterfall” and hanging off the many logs that cross the river. We grab a morning soak as well before embarking on day three of the drive. This makes it a very reasonable 7 hours to Whitehorse – great to end on the shortest drive day. 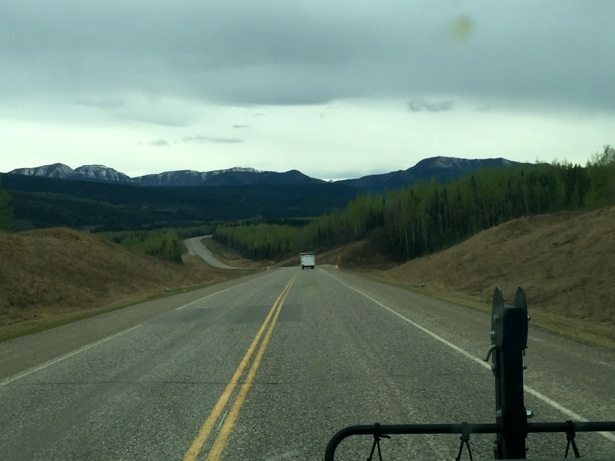 The highway between Liard Hot Springs and Watson Lake hopscotches between BC and the Yukon a few times and the views of the mountains change along with each of these bends, going from clear and present to distant and remote. 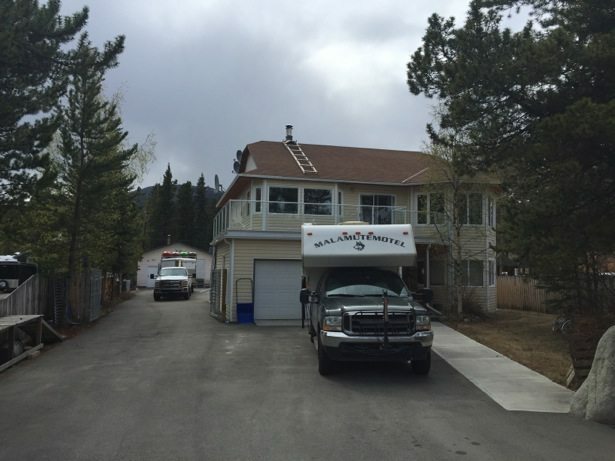 Watson Lake is a fun pitstop to stretch your legs and grab gas for the last 4 hours of the drive. 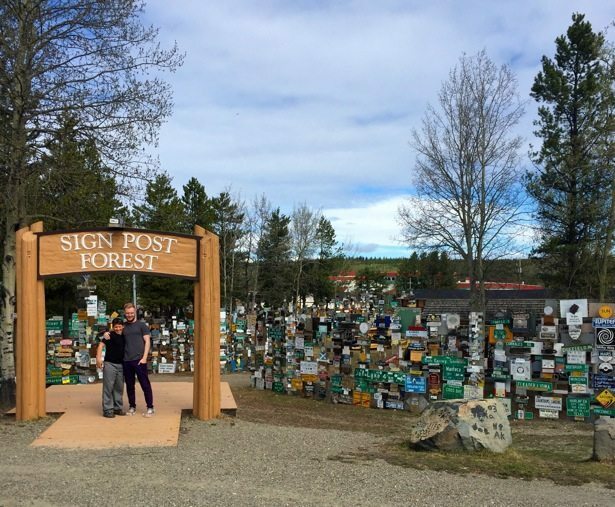 Be sure to check out the sign post forest and try to find a post from your home city/state/province/country. If you are creative and plan ahead you can actually bring your own! The mountains are now a regular part of the scenery and still snow covered in early May. 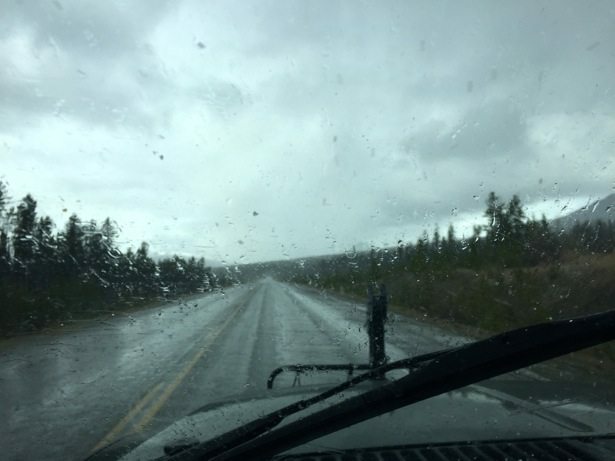 After two and a half days of fabulous driving weather we ran into an hour of heavy rain coming out of Teslin. 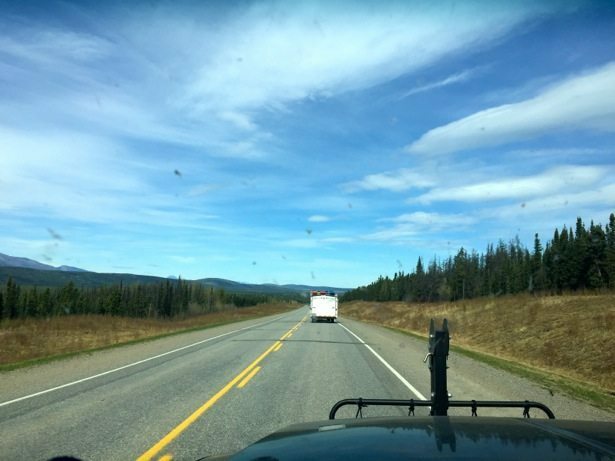 Luckily it eased up as we approached Whitehorse and we were greeted by sunshine and clear skies as we pulled in the lane way. Home…a sight that has brought a lot of mixed emotions across the family. More on that later.